The Industrial Revolution has escalated into all-out warfare. It has been sixteen years since the Heterodyne Boys, benevolent adventurers and inventors, disappeared under mysterious circumstances. Today, Europe is ruled by the Sparks, dynasties of mad scientists ruling over--and terrorizing--the hapless population with their bizarre inventions and unchecked power, while the downtrodden dream of the Hetrodynes' return. 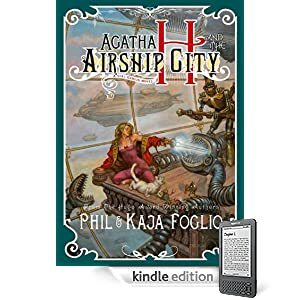 Or purchase Agatha H and the Airship City as a DRM-free e-book in the format of your choice through WebScription.net.